Fully furnished studio with large windows and great natural lighting and with a click of a button the automatic blinds can be lowered with black out blinds. The studio features an all-in-0ne open living space with a half kitchen, that opens up onto a living area with a cozy chair and desk and queen size bed complete with premium hotel linen. Includes AT&T Internet Hulu Live TV (premium cable service), Netflix, wireless Sonos speakers, Nespresso Coffee and Pantry Premium toiletries. The Belvedere Condominium has 24 hour security with secure parking and direct access to level 1 to 3. The amenities include heated rooftop pool with hot tub (please note the pool is seasonal), well stocked gym with plenty of cardio and weights, media room and lounge with 2 pool tables and free Wi-Fi access. All guests have full access to the condo and building. Checkin & checkout is totally automated with keyless entry and house guides so there is no need to drop off or pickup keys to a person. This allows easy flexibility for our guests. For reservations over 30 days, guest will be provided a complimentary full service clean. At Millennial Living we aim to make your condo your home away from home! High quality Sony TV with sound bar and Sonos speakers so you can be entertained by the provided Hulu Live TV and Netflix! All condos have WiFi so you can stay connected. All linens are of top hotel collection so you will always feel rested. Our kitchens are stocked with everything you will need to create your own meals, all you need to do is stock up the fridge. You will also find a Nespresso Machine, Milk foamer and all the pods so you can start each morning with a delicious coffee. We uniquely also have live beautiful plant arrangements, you won't find any plastic plants in our condos. Millennial Living also stocks your condo with mind-relaxing Pantry aromatherapy toiletries! Millennial Living provides affordable first class boutique housing, healthy and fashionable lifestyle in Reno. Our mission is to give you a real home away experience including all those little things, like complete entertainment with Hulu Live TV (premium cable service) Netflix , high speed internet, beautiful plant arrangements, delicious Nespresso coffee, mind-relaxing Pantry Premium toiletries. Our goal is to offer the business community and leisure traveler a selection of furnished homes, providing quality lifestyle amenities for work assignments or vacation travel in Reno’s fast moving and diverse business and recreational environment. Home rentals are available for periods of 5 days to 1 year. At Millennial Living we have rentals that fit your lifestyle. Our goal is to offer the business community and leisure traveler a selection of furnished homes, providing quality lifestyle amenities for work assignments or vacation travel in Reno’s fast moving and diverse business and recreational environment. Home rentals are available for periods of 5 days to 1 year. At Millennial Living we have rentals that fit your lifestyle. We loved our stay here. It was everything as advertised and more! We were sorry to have to leave and will stay again. Enjoyed our stay at the milinium unit at the Belvedere apt. The building was safe and all the people residing there were friendly and helpful. The apartment was well supplied with quality amenities and we were very comfortable. The panoramic view was great, we were there in Feb. so we enjoyed the snow capped mountains, and bright sunlight. Lots of technology that all worked well, and the owner was very easy to work with. We would diffenently rent this unit again. 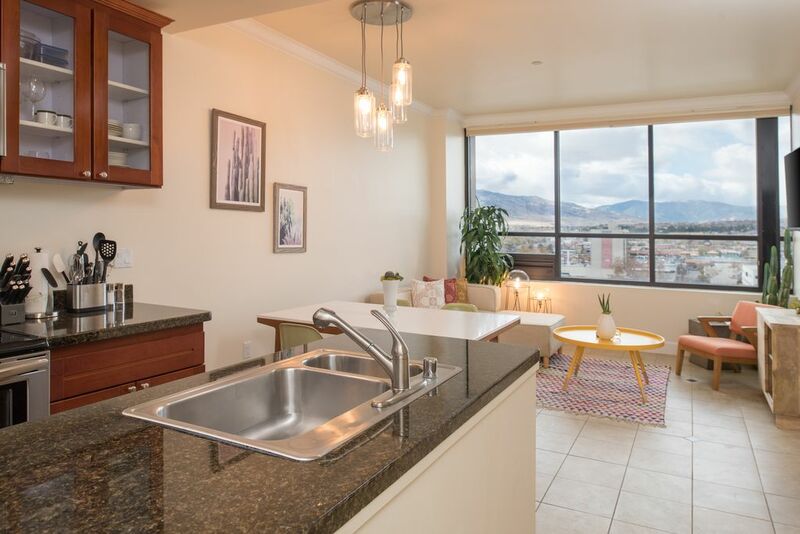 This is a beautiful, tastefully furnished apartment in downtown Reno. The building and parking garage are safe and secure with a security guard. The apartment is very clean and has everything needed for a relaxing stay. The bed is very comfortable, with high quality linens. It is a very roomy unit, and the washer and dryer, plus supplies, in the apartment are a real plus. The owner was a pleasure to work with, checking in and out was hassle-free, and the rental cost was great bargain. The building is very quiet, the residents were friendly, and it is a perfect place for one or two people. We would definitely like to stay here again. Spotless on arrival. Fantastic views and great location. Loved the washer and dryer (and supplies!) In the condo. Plenty of kitchen essentials, too. Very quiet building. I felt very safe. Plenty of secured parking. Comfy bed, too!